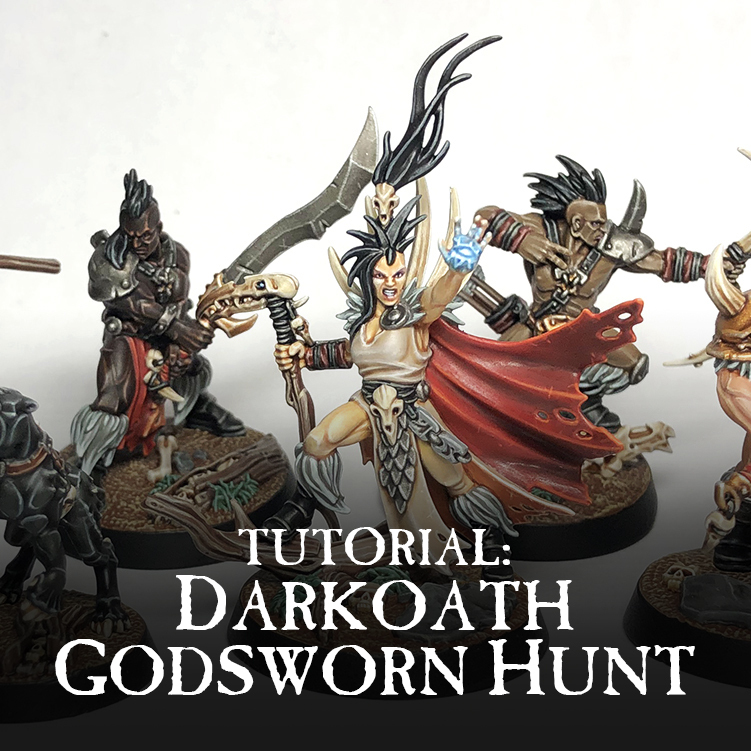 As soon as I saw the teaser for the Godsworn Hunt warband for Underworlds I knew I was going to paint them up. There's just something so cool and unique about the Darkoath aesthetic within the universe of Age of Sigmar. These smaller warbands also let me put a little more time and experimentation into them. 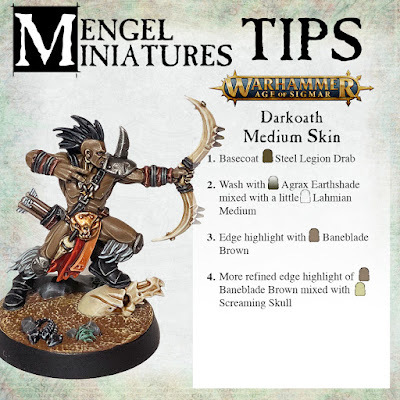 I think one of the things that really stood out to me about the Darkoath models is that they look more like your traditional barbarians than a Chaos marauder. 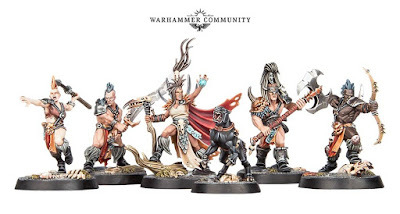 Sure, they have skulls, and evil faces on their armor, but nowhere, on any of their models, are there actually any overt Chaos symbols. It's refreshing. They feel like a nomadic warrior people who just so happen to worship Chaos. They aren't so far gone that they're sprouting extra limbs. Not yet at least. 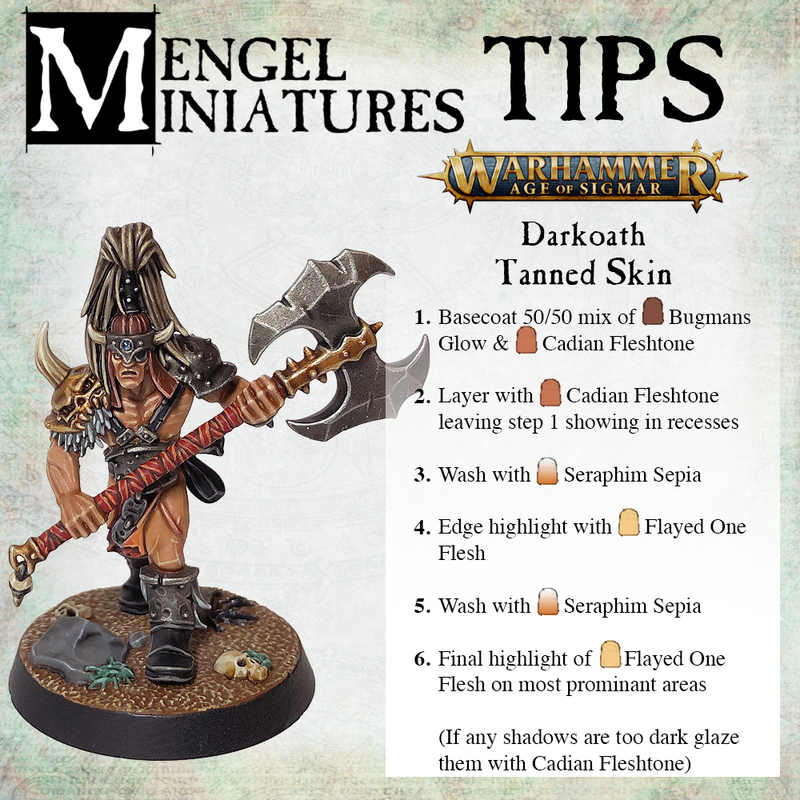 One of the goals I had when I picked these models up was to explore different skin tones than what I normally paint. 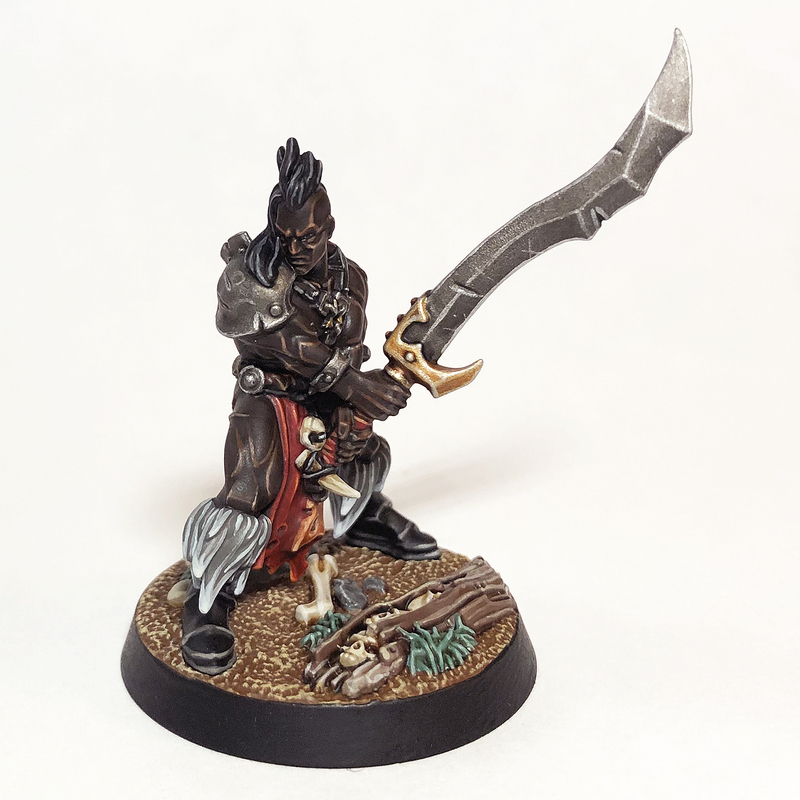 Coming off of the Daughters of Khaine army, which was all very pale skin I wanted to try something different. This meant the method of painting as well. No more washes over white for these guys. Instead I planned on using some more traditional methods. I also considered coming up with my own color scheme, but in the end I just like the studio colors too much. The red cloth with the orangish brown leather just looks so cool and natural. Plus, I don't have an army or force yet where red is a prominent color. 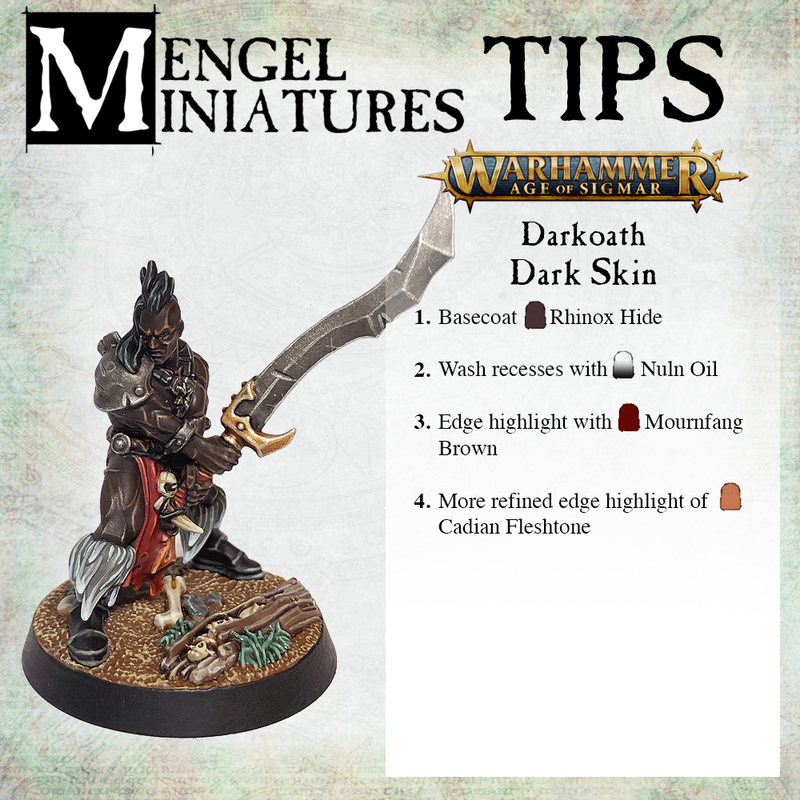 I did paint up the Darkoath Warqueen model from Malign Portents to try and nail some of the colors down before starting in on the warband. 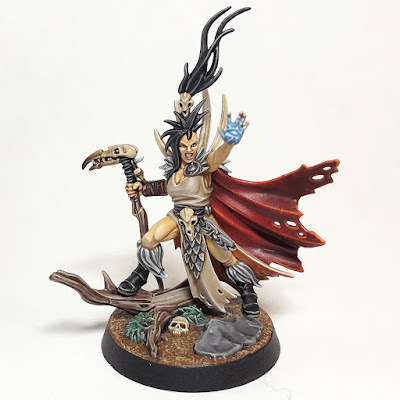 She was a lot of fun to paint, and also gave me my first shot at a different skin tone. I decided to paint her base using Martian Ironearth and a lot of reds to give it a fantastical atmosphere that would be at home in Chamon. The idea was that the earth was saturated with iron there and the rocks all had a dull metallic sheen. While I liked the look of it, it was a little too hard to replicate on the sculpted Underworlds bases, so I decided to revert back to a more traditional brown dirt look. Honestly, this helped frame the model more anyway. I'll return to the Chamon basing with a future project at some point. 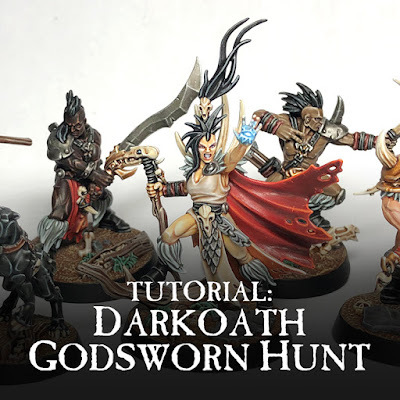 I started right away on the Godsworn Hunt with the skin. 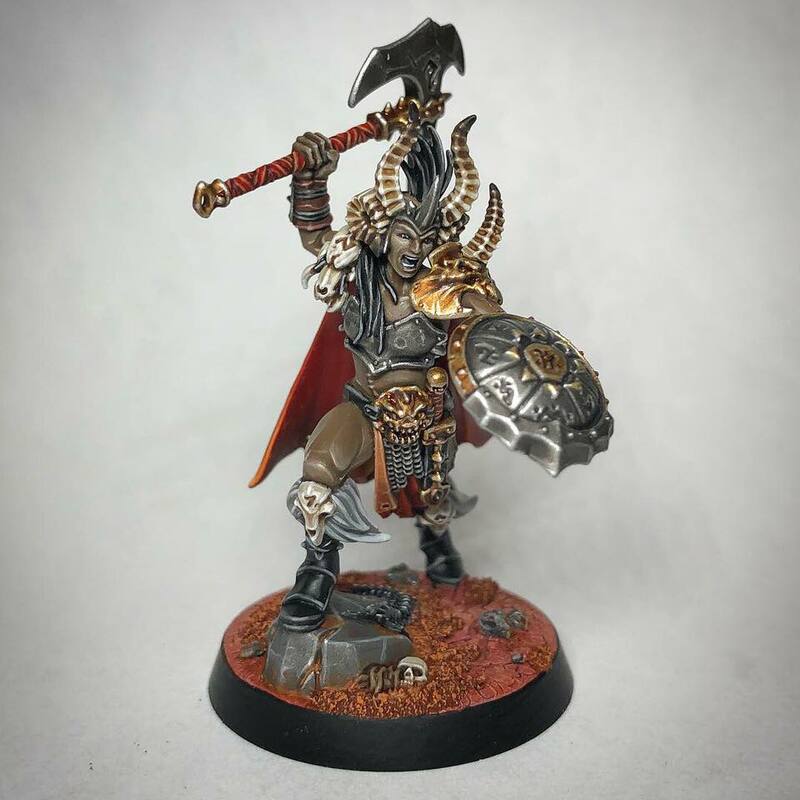 For the first model I decided to go really dark. I did plan out what skin tone I was going to use on which models at the start, but I wasn't going to hold myself to that if I decided to change my mind. For Shond I went as dark as I could and highlighted up to Cadian Fleshtone. This looked a little stark at first, but once the rest of the colors were on there it balanced out. 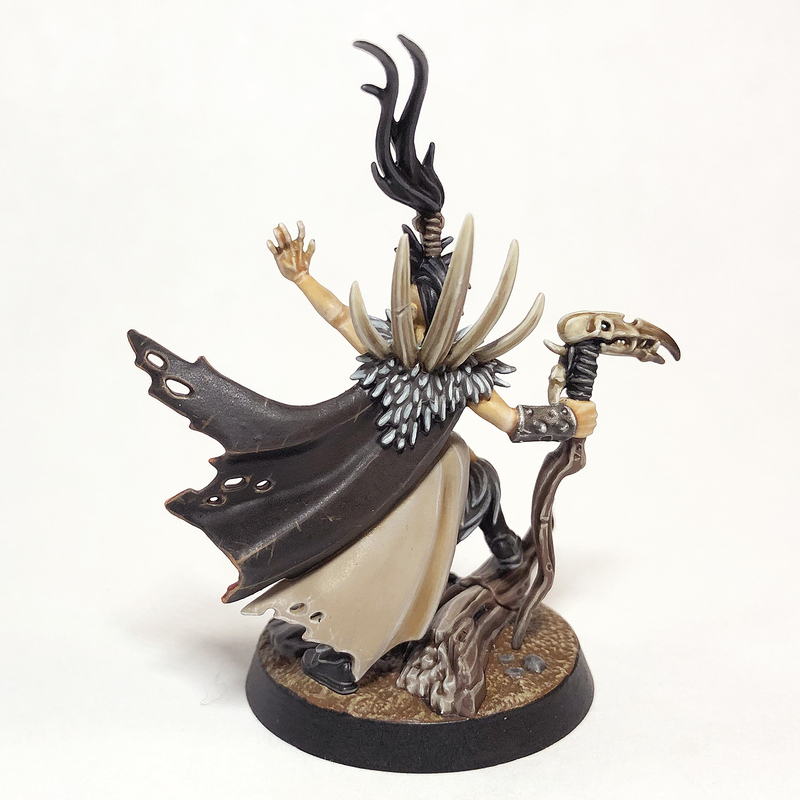 Next up was Ollo, who I decided to copy the skin tone from the Warqueen. I figured I wanted some repeats within the group to make it believable. I didn't spend as much time blending his skin as I did the Warqueen though, but I think it still looks good in the end. Now you can kind of see how this skin tone works with both a more methodical approach and something faster. I knew from the beginning I wanted to paint up the Conan looking guy to have that overly tanned look that was so prevalent in the 80's. I had to match him to his likeness. This was a bit of an experiment since I really had no idea how it was going to turn out and just hoped for the best. 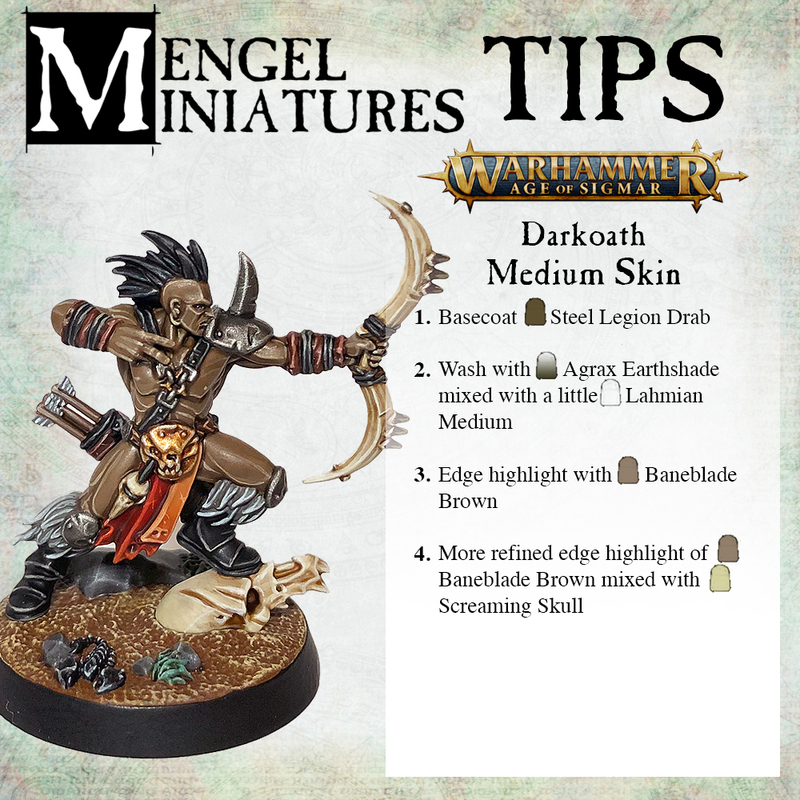 It's always risky using shades or really strong glazes to fundamentally alter the color you're painting since there's the chance it could dry splotchy, or be a completely different color than you were hoping for. In the end I'm really happy with how this guy turned out though. Another problem with painting something this way, is that if you accidentally get paint on it later it's harder to touch up. I got a close approximation of the color by mixing Cadian Fleshtone with Seraphim Sepia. It's not an exact match, but for little touch ups you can't really tell. Jagathra was going to be my one super pale model. Since I wasn't doing my wash over Corax White technique though I had to start from a basecoat of Flayed One Flesh. I also painted her hair at the same time since it used some of the same colors. I basecoated it Screaming Skull, washed it with Seraphim Sepia, highlighted it with Screaming Skull again, then did a final highlight of Pallid Wych Flesh. 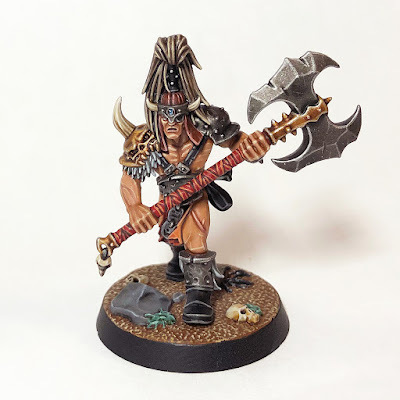 As the leader of the warband, Theddra got the most attention. 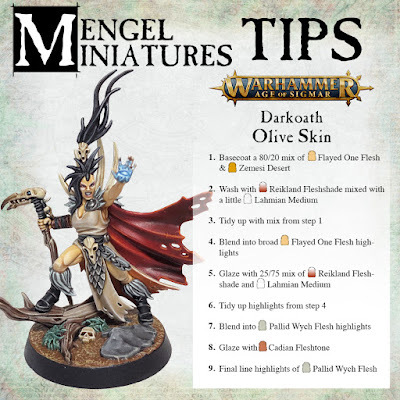 I wanted her to have a much more olive complexion and really was unsure of what to do at first. After a little experimenting on my palette I had a mix I was happy with. About halfway through I was afraid her skin looked a little too saturated, so I pushed the highlights a bit more and did thin layers to blend it together. 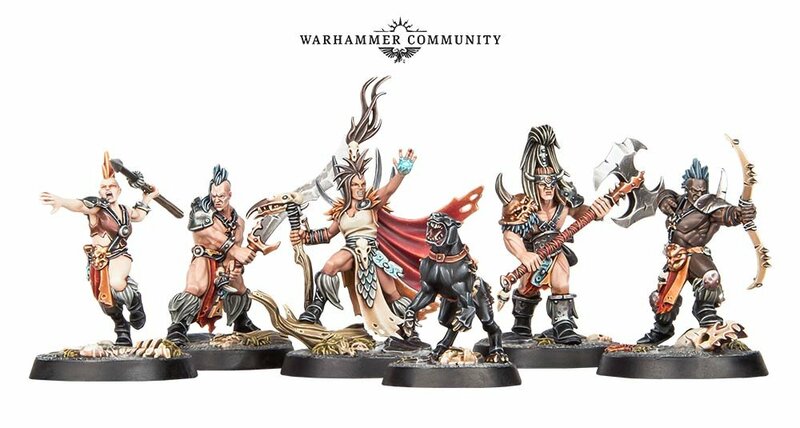 The rest of the colors on the warband were a little more straight forward. I did have some fun trying to match, as close as I could, the colors on the studio scheme. The red is just a base of Mephiston Red shaded by mixing some Rhinox Hide in and highlighted by mixing some Troll Slayer Orange in. The brownish orange on the back of the red is a base of Jokaero Orange, which was my first time using that color. I really like the look of it so I'm glad I finally had an excuse to use it. 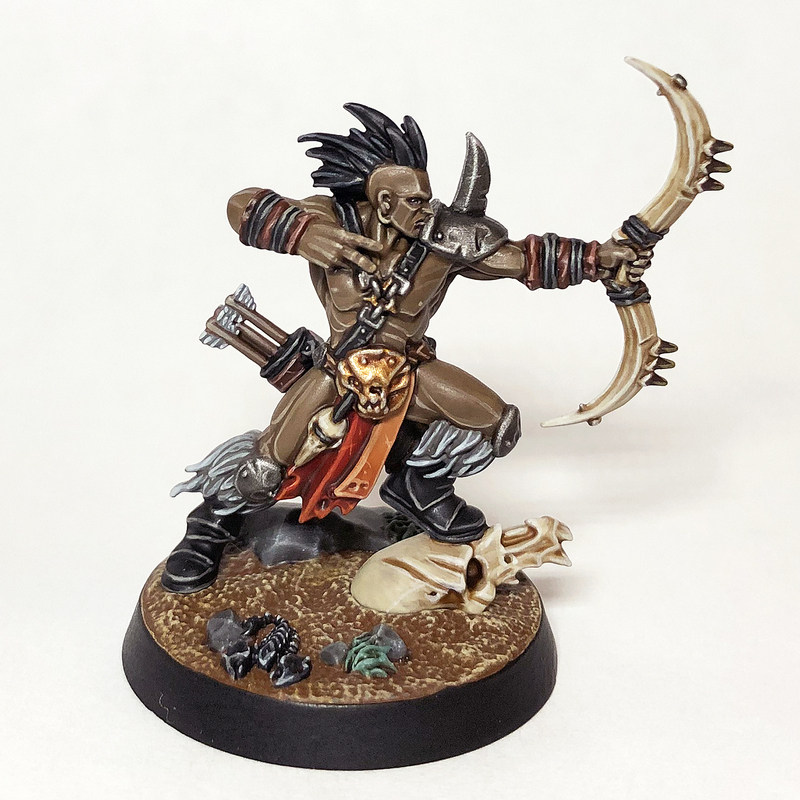 The shadows are done with watered down Skraag Brown and the highlights are by mixing in Screaming Skull. This helps give it a browner quality instead of orange. Once I had finished the skin I thought I was pretty much done with the majority of the model, but there guys are deceptively detailed. I ended up having to do several different shades of leather since they have so much of it on them. 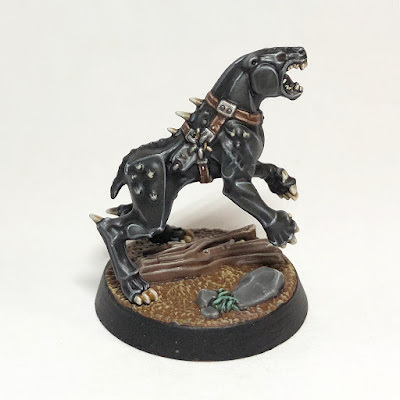 The black leather was highlighted with Stormvermin Fur and then Karak Stone to give it a warmer quality. The bases were a lot of fun to paint too. I didn't glue the models onto their bases while painting them so I could remove them to paint the bases seperately. This made it a ton easier since there was a lot of drybrushing with the ground. Since the models have pegs on their feet they fit in pretty snuggly as well. I painted the dog in a similar way to the Moonclan Grot robes I did a tutorial for. It's Mechanicus Standard Grey washed with several coats of Nuln Oil, and then highlighted up with Dawnstone and Ulthuan. This gives it a slightly more organic feel that straight black doesn't really convey. The glowing effect on Theddra's hand was done by first glazing the area with Guilliman Blue. I then worked up the glowing part with Teclis Blue, Blue Horror, and lastly white. I did a few more glazes as I went along, some of them with the lighter colors, to give it a softer feel. The back of her cape was done with a base coat of Rhinox Hide, which I then shaded in the recesses and near the bottom of it with Nuln Oil. I then mixed in Jokaero Orange for the highlights to give it a warmer feel and help tie it into the rest of the colors. 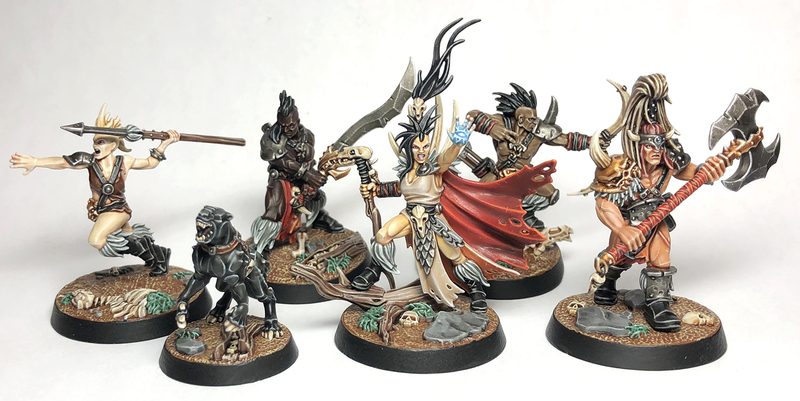 I really enjoyed painting all of these and I definitely plan on painting up the Darkoath Chieftain model from Silver Tower to go along with all of them. They ended up taking longer than I expected, but in the end I think it was worth it.